What is the latest version of TurboNote Relay Server? What versions of TurboNote+ can I use with TurboNote Relay Server? Can I use TurboNote (the freeware sticky note product) with TurboNote Relay Server? What are the system requirements for TurboNote Relay Server? How does this connection help me? How does TRS work with firewalls? Version 3.4, released October 2009. You can download TRS Personal Edition and use it free of charge. If you are a licensed user of TRS Office, you should have received download information when you made your purchase, and updates whenever a new version is released. To both send and receive notes via TRS, you must be using TurboNote+ V5.0 or later. TurboNote+ v4.5 or earlier will receive notes sent to it via TRS, but cannot send or reply to notes using TRS. 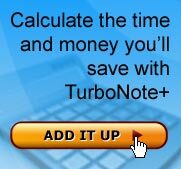 TurboNote will receive notes sent to it via TRS, but cannot send or reply to notes using TRS. To both send and receive notes via TRS, you must be using TurboNote+ V5.0 or later. TRS will run on any Windows computer. Because TRS is a network communications program, reliable and efficient operation requires that your networking hardware and Windows networking configuration be correctly installed, well-tested and well maintained. You must buy a licence for each separate server on which you will be running TRS Office. You also need to specify how many connections (i.e. computers running TurboNote+) you need to support with each copy of TRS you licence. TRS gives you an easy way to send notes to colleagues, whether they are in the next room or the next country. It also lets you send messages, even when their machine is turned off, so it's great for communicating across timezones or shifts. And it supports archiving of all notes it processes, so you have a permanent record if necessary. A firewall is a software or hardware combination which protects a local network from unwanted access to or from the "outside" (typically the Internet). Usually, a firewall will block most TCP/IP communications, but permit certain kinds, such as Web access. Firewall protection is often combined with special "proxy server" software whose job it is to relay the permitted traffic between the local network and the outside world, and vice versa. The computers in your local network only have indirect access to the Internet, because they depend on the proxy server to relay the appropriate Internet traffic. That is, a local computer cannot directly "see" (e.g. "ping") computers which are directly attached to the Internet. If it cannot communicate directly with them, it cannot send them a TurboNote. The computers in your local network will not have identities or IP addresses which are known to the computers on the Internet. These identities are what TurboNote+ uses to send messages. Resolving the first issue simply requires the correct firewall configuration. TurboNote Relay Server is specifically designed to solve the remaining issues, with additional benefits such as automatic note queuing, activity logging, close control of who can send what content, and so on.